I have a confession, as a youth I my appreciation of zucchini was restricted to the marvelous blossoms, the fried fritters my grandmother made. As an adult my palette opened and I can finally appreciate this healthy and versatile vegetable. 1. Preheat oven to 400F. 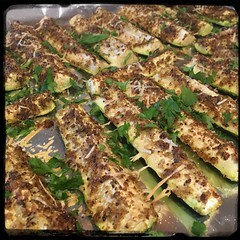 Cut zucchini in into quarters, lengthwise to make wedges. 4. place in preheated oven and cook for about 20-30 minutes. 5. remove from oven, drizzle with a bit of olive oil and toss some fresh chopped flat leaf parsley on top.